Chain Blocks are available in a range from 1 tonne – 8 tonne. Height of Lifts available from 3 – 35 metres. Twin pawl brake works instantly when the operation is stopped. Brake lock out test" as per BS 3243 with a 5% load of the rated capacity. Highest quality alloy, calibrated load chains in Grade 80 (T) or 100 (V) conforming to EN818-7 and ISO 16872. Drop forged and heat treated alloy hooks are furnished with heavy duty spring latch kits. All major components are heat treated and precisely machined. High gear ratios keep physical effort to a minimum. Also fitted with a slipping clutch overload mechanism to protect from overload. All units are fully LOLER certified and a Report of Thorough Examination, as well as Tiger UK training for test and inspection of their chain blocks. Essential health and safety requirements and light load test of 10-20% of the rated capacity are performed on all Chain Blocks, which exceeds the requirements of the current applicable standard. Manual Chain Blocks are the perfect piece of equipment for many situations, from install to refurbishment works. 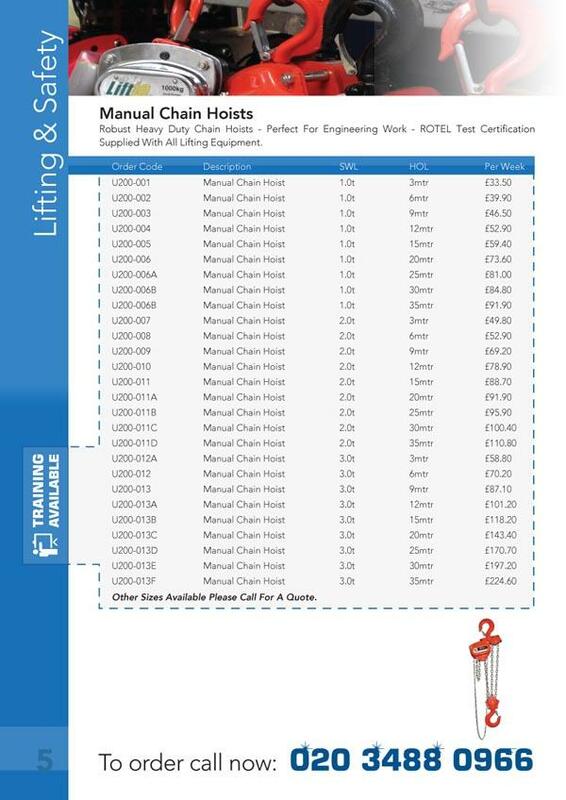 Both single and multiple drop chain hoists are available for hire, and sale. Chain blocks are great for working in all conditions and situations. Mostly they are used when electric hoists are not available for use due to power supplies on site. Or they can be a cheaper alternative to using electric winches or Minifor hoists.